By its very name, a history museum focuses on history. It preserves the past and honours the olden days. At the Meacham Museum, they are doing things a little bit differently. To help celebrate the past, they are turning to the future. The Junior Curators Program was established in June 2013 to give local children an opportunity to become further involved with the museum, which is located in the community of 93 residents approximately 70 km east of Saskatoon. There are currently eight children involved in the program between the ages of five and nine. “The program started with the kids themselves. They were wanting to be part of the museum,” says Flo Frank, mayor of Meacham and one of the founding members of the museum. As junior curators, the children are responsible for giving tours and talking about the exhibits, which are changed every three months. They also play the DVD that accompanies each show, as well as ask visitors to sign the guest book and thank them for coming. Four of the junior curators have also attended museum board meetings, where they provided reports on progress. They also participated in planning sessions for exhibits and shows. “If there’s four of them together, they’ll break the room into quadrants,” Frank explains. “If there’s two of them, they’ll break the room into half so that they know a few key things on each side. In order to understand their responsibilities at the museum and lead visitors – predominantly adults – on tours, the junior curators are required to take training as part of the program. Given the age difference within the junior curator group, the children helped design the training so that they could learn the same things in the same way. Once they complete the training, along with 10 hours of volunteer service at the museum, the junior curators receive a certificate. 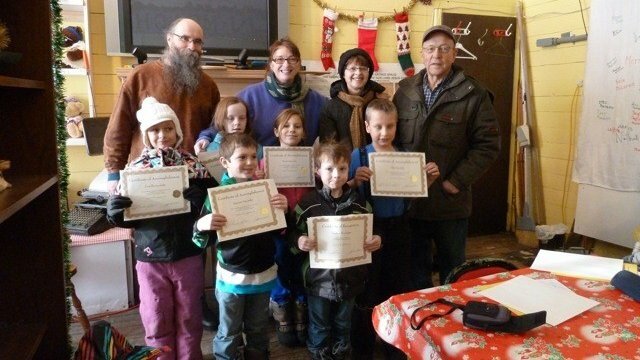 To start off the new year, six of the junior curators had completed the program and received their certificate. The other two members are currently completing the training and volunteer service.